Mom's Gone Bronson! 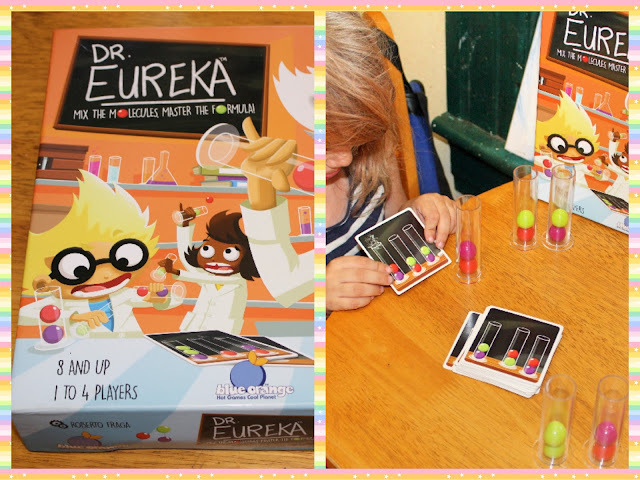 : Dr. Eureka - Building Skills, Learning and Having Fun with Blue Orange Games! Dr. Eureka - Building Skills, Learning and Having Fun with Blue Orange Games! Disclaimer: I was provided with products in order to give my honest opinions. I was not otherwise compensated. Thank you. Designed by Roberto Fraga, this is a hands-on, learning game for kids 8 and up, but my daughter, who is nearly 6, loves this game a lot and so does my step son, who is a young 12. The basics to this game are that you each get 3 viles, with 6 balls, which represent molecules. You then have to be the first person to get all of your "molecules" in the right order to correspond with the pattern presented on the card that comes up for that round. The players have several ways of getting to the end result of the displayed "molecules". They can pour from one to another (vile) and end up with the result or they can even simply tip the vile upside down to get there. There are other ways to play, also, which can make it easier or harder depending on age or level of confidence. When you think you have the right result, you should EUREKA! Then, once a player has been determined as the winner, all viles are put back in their upright position (if they were turned) but the "molecules" do not reset. You continue with those just right where they are and start the next round. The overall winner is the person who wins several rounds and you can add extra if you want to prolong a game. This is a simple game with lots of energy and hand-eye coordination, with dexterity and cognitive learning skills involved. The players are also lead to grasp the idea of molecules, which has sparked a conversation with my kids on just what exactly a molecule is - which is a learning moment you might want to explore if this happens to you. The whole family can play this game, it keeps you thinking fast and everyone likes to compete. I would keep it away from youngsters though as the balls are a choking hazzard in the wrong hands - definitely not a game for my 2 year old, so we've had to play this game during his nap so that he doesn't get hold of the pieces, and so that he doesn't feel like he is being left out. The presentation of this game is nice, clean and bright. It is easy to pack up in the box that it came in and the rules and game-play are simple and easy to understand. I would definitely consider this a gift-giving game that kids will enjoy and that will spark some science conversations and a learning window. Definitely giving this one a 10/10 as we all enjoy it a lot and we can run several rounds before anyone gets bored. Well worth a look! Find this game, and many others, on Blue Orange Games'! I think this would be a great game to integrate learning Science. How fun! We love little games like that.